Two officers were shot early Thursday morning in Ferguson, Mo., which has once again become ground zero for police-involved shootings. The incident took place in front of police headquarters, where community members gathered to protest the Justice Department's report that questioned police tactics following Michael Brown’s death. USA Today says no suspect is in custody and the officers are expected to recover, but the events are a reminder that police, like Ferguson's, can be shooting victims, and fatalities can also come from the ones in uniform. In 2014, law enforcement fatalities rose 25 percent, according to data from the National Law Enforcement Officers Memorial Fund. Firearms-related incidents were the number one cause of officer deaths, a 56 percent increase from the previous year, the report said. 2013 was actually the safest year for police in 70 years. 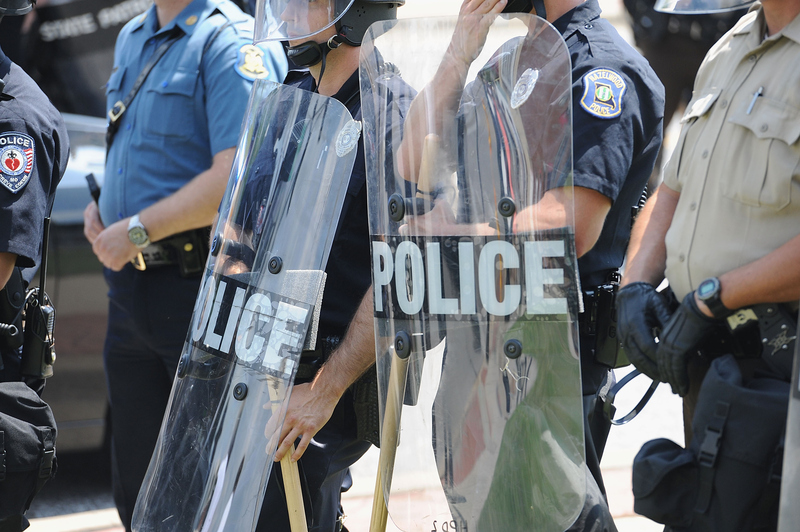 Recent spikes in alleged police brutality have led to calls for policy changes in how law enforcement enforces the law. Los Angeles Mayor Eric Garcetti announced in December plans to put body cameras on 7,000 police officers to ensure they work with transparency. But guns aren’t exclusive to law enforcement, and a police-involved shooting doesn’t always mean the officer is holding the smoking gun. Two New York City police officers were shot and killed in December while sitting in their patrol car. Wenjian Liu, 32, and Rafael Ramos, 40, were gunned down by Ismaaiyl Brinsley, a 28-year-old man who, on social media, threatened to put “wings on pigs.” Brinkley committed suicide soon after fleeing the scene. Pennsylvania trooper Byron Dickson, 38, was fatally shot in September after 31-year-old Eric Frein reportedly fired a high-powered rifle at officers during a shift change. Trooper Alex Douglass, 31, was also wounded. Frein went on the run for six weeks and was later found 35 miles from the shooting site in Blooming Grove. In July, rookie cop Melvin Santiago, 23, was fatally shot in the head after responding to an armed robbery report at a Walgreens in Jersey City, New Jersey. The shooter, Lawrence Campbell, 27, reportedly stole a guard’s gun and waited for police to arrive. Campbell was later shot by police and pronounced dead at the scene. Off-duty officers Alyn Beck, 41, and Igor Soldo, 31, were eating lunch at a Las Vegas pizza parlor in June when they were fatally shot by married couple Jerad and Amanda Miller. A man was also shot and killed after attempting to stop the Millers. The shooting pair both died by police fire.